The huge array of 66 ALMA antennas is located at the Chajnantor Plateau in the north of Chile, at 5,000 meters altitude. The site is known as the AOS – the Array Operations Site. Because of the high altitude, the air at the AOS is very thin. There’s not much oxygen to breathe. So it’s almost impossible to do heavy work there, like putting a large antenna together. Instead, the antennas were built at the ALMA base camp, at an altitude of 2,900 meters. The base camp is known as the OSF – the Operations Support Facility. From there, each antenna had to be transported to the AOS, over a 28 kilometer long steep mountain road. So how do you transport a 100-ton antenna? You can’t just put it in the trunk of your car! Engineers in Germany came up with the solution. They designed and build two giant transporters that can do the job. They are called Otto and Lore. They are much larger than a normal truck. Each transporter weighs 130 tons and has 28 giant wheels. Two drivers are needed to precisely position the transporter beneath an antenna. The antenna is then slowly lifted up, and can be moved around. Otto and Lore are also used to move the antennas around at the Array Operations Site. There are 66 antennas, but they can be positioned at 192 different foundations, spread out over the Chajnantor Plateau. It’s a very precise job: the locations of the antennas must be known with a precision of less than a millimeter! Sometimes, the ALMA antennas are spread out over an area 16 kilometers across. They work together as one giant eye with a very sharp eyesight, focusing on a small part of the sky. It’s like using a telephoto lens on your camera. At other times, the antennas are close together, to form a smaller eye. In that case, the eyesight is not as sharp, but ALMA can see a much larger part of the sky. It’s like using a wide angle lens on your camera. So if astronomers want to study a large nebula in the sky, Otto and Lore move the ALMA antennas close together. And if they want to see fine details in a distant galaxy, or if they want to study the formation of planets, Otto and Lore move the ALMA antennas as far apart as possible. The two giant transporters allow astronomers to use ALMA as a zoom telescope. Sometimes, an antenna has to be taken down to the Operations Support Facility, for maintenance or repair. Again, Otto or Lore will gently lift the antenna up, and slowly take it all the way down to an altitude of 2,900 meters. 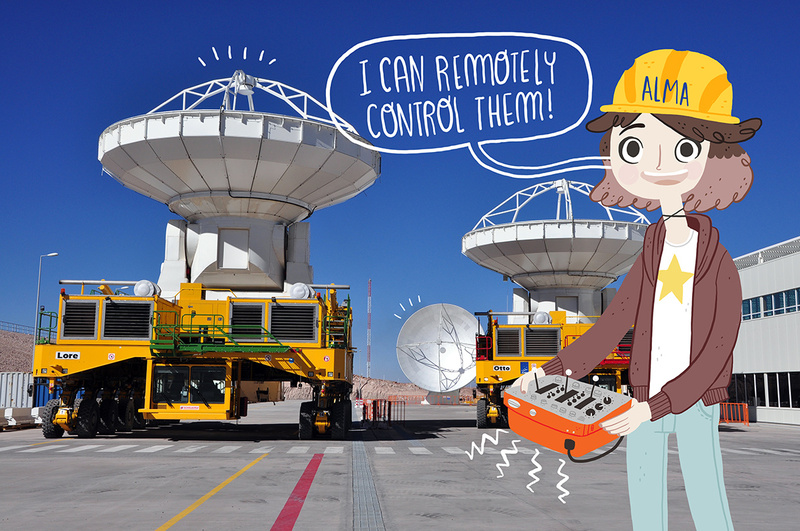 Fortunately, ALMA is not blind when one antenna is missing. It can continue its observations, although the sensitivity is a bit lower.